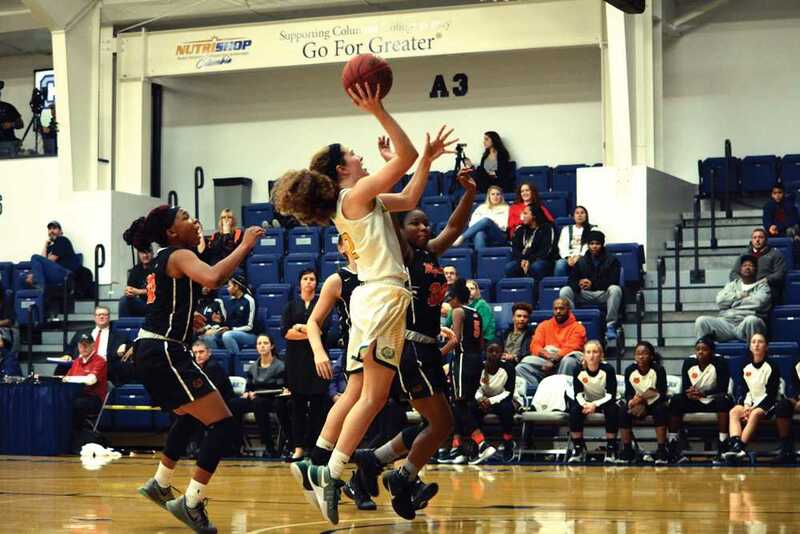 Last year, the RBHS girls’ basketball team struggled from the very beginning of the postseason, ultimately eliminated at the very beginning of the district tournament. In this year’s championship, however, the complete opposite happened for the Lady Bruins, who emerged with a 48-36 victory against Blue Springs South (BSS) and sealed a district win for RBHS on March 3. From the tipoff, it was apparent that neither team would go down without a fight. The entirety of the first quarter was permeated with gritty defense as both teams stood their ground against each other. By the end of the first, RBHS narrowly led BSS 9-7. The second quarter had little, if any, differences regarding the stiff back-to-back competition, as RBHS led BSS 18-14 at halftime. In the third quarter, however, it became apparent that the tide had turned in the Lady Bruins’ favor. RBHS managed to utilize their quickness on offense to their advantage, propelling the team to a more comfortable 32-24 lead at the end of the quarter. Brown alone added 10 points to the scoreboard in an impressive display of offensive power from RBHS. At the final buzzer, RBHS had emerged victorious in what had initially been a close game, but eventually swayed in favor for the Lady Bruins. Now, however, the team is looking forward to their next game vs. Lebanon on Mar. 8. In the midst of the preparation, Brown said she is excited for what she believes will be a passionate sectionals matchup. Do you think the Lady Bruins will beat Lebanon in sectionals? Comment your predictions in the comments below.